Beta than the real thing? Human stem cells implanted successfully in a mouse. Image courtesy Doug Melton. 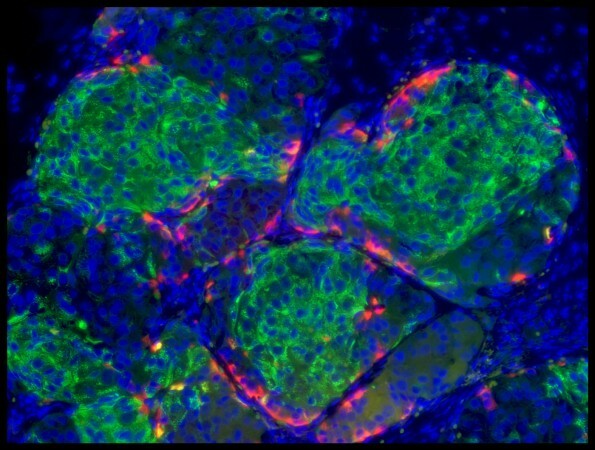 We know a true cure for type 1 diabetes will require both a new supply of insulin-producing beta cells and a new way to stop the autoimmune attack that wipes out the original cells. We’ve seen great progress in the past decade on the first challenge, as researchers have learned to morph embryonic stem cells and then normal skin cells into beta cells that now might be very much like the real thing. But despite all we’ve learned about the autoimmune attack and all the clever ideas that have emerged to stop it, so far there’s no clear way to do so. Today the best bet for autoimmune defense is to embed engineered beta cells in intricately designed porous capsules. While most attempts use spherical capsules on a millimeter scale, last fall Viacyte launched a clinical trial for a device the size of a credit card. We’re all rooting for this trial’s success. But even if it works well, the encapsulated cells won’t function quite normally or last forever. “I want a forever solution,” says Harvard’s Doug Melton, who has led much of the stem cell engineering work. At a JDRF session in Boston back in March, Melton suggested two approaches to further modify those engineered cells to dodge the autoimmune bullets. “These are two of my favorite ideas, but I’ll remind you that most of my ideas turn out to be wrong,” he said wryly. One idea follows the playbook of the hot new class of cancer immunotherapies known as “checkpoint blockaders” —or rather turns it on its head. Melton prefers a second concept, which taps into one of the large questions of immunology: Why doesn’t a mother’s immune system attack the fetus she carries? Cells called trophoblasts that initially wrap the embryo help to provide the immune shield, he notes. So why not express key trophoblast surface proteins in beta cells, so that the beta cells look like fetal cells to the immune system? While autoimmune researchers have been kicking around both of these ideas for years, it’s still very early days for bringing beta cells with self-protective surfaces toward the clinic. I’m looking forward to hearing about more and better betas from him and from other leading researchers this Friday afternoon, at a session during the American Diabetes Association’s annual scientific conference in Boston.